We studied the effect of 4-methyl-phenyl biguanide, a substance chosen by PASS software (Prediction of Activity Spectra for Substance), on oxidative status and activity of oxidation metabolism enzymes participating in limitation free radical processes (aconitate hydratase, glucose-6-phosphate dehydrogenase, and NADP-isocitrate dehydrogenase) in the heart and blood serum of rats with cardiovascular pathology developing against the background of experimental rheumatoid arthritis. Activity of cardiomyocyte cytolysis markers in rat blood serum was also measured. 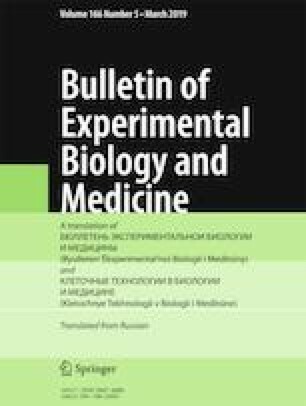 Normalization of the studied parameters under the influence of the test compound in animals with experimental pathology attests to its positive effects on metabolic and free radical processes.